Fresh slices of Certified Angus® Beef with fresh Chinese Baby Bok Choy, Stir-fried on an Extremely Hot Large Stationary Wok at over 500°F along with fresh finely chopped garlic with Chinese special sauces including oyster for a rich dark brown sauce. Served with a small cup of gourmet Steamed premium Jasmine Rice. 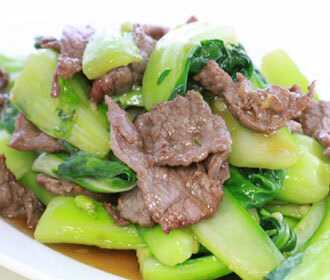 Crisp stir-fried bok choy with tender beef strips.